With a small sample of its portfolio displayed at Habanos s.a. stand at this prestigious Fair, the company is aimed to build up its commitment with the most demanding smoker, combining the excellence of quality with blends which delight for their exclusive taste, recreated in a huge variety of formats and presentations resumed in just one aim: To offer the pleasure of smoking a unique product since 1492: the pleasure of tasting luxury. 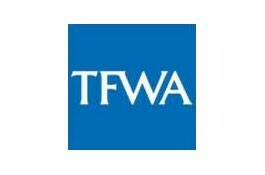 The TFWA Cannes Fair, to be held from October 23rd until 27th is an excellent opportunity to share experiences and feelings amongst rings of smoke. 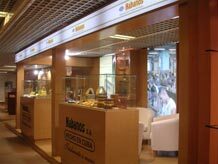 The Habanos s.a. stand is to be found at the Mediterranean Village P8 with an extended invitation to everyone who wants to get a closer look of its products. First of all, Habanos s.a. will be introducing its first product exclusively made for the Travel Retail and Duty Free channel: The Montecristo Travel Humidor. 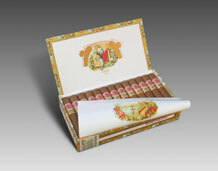 This item was especially designed for those Habanos lovers on-the-go. Easy to carry, to keep and to use. Practical and simple but elegant and stylish at the same time, this humidor comes in a bag with the iron-stamped brand logo and inside a carton packaging that reproduces the colours of the brand. The Montecristo Travel Humidor is the best option for travellers who don’t want to leave their smokes at home but to keep them in perfect conditions, ready to be enjoyed anytime they please. Habanos s.a. will show a selection of its flagship products at Travel Retail along with a sample of its 2006 Limited Edition, the vitolas: Partagas Serie D No.3, Montecristo Robustos and Cohiba Pyramids which are not listed on the regular portfolio of these brands. 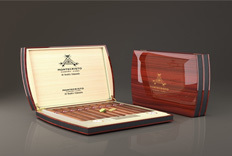 These vitolas are the most successful ones in the past 5 years when the concept of the Limited edition was born. They are bearing commemorative bands and sticks. Along with this, the 2006 Special Series aimed to Las Casas del Habano shops will be showed as well as a new line of cigar accessories for smokers recently developed. Habanos s.a. will celebrate the “Romeo and Julieta Cocktail” which will take place in L’Scala Salon at the Noga Hilton Hotel on Tuesday 24th, and in this great occasion friends, clients, Habanos Exclusive Distributors, journalists, VIP, Duty Free top executives and business men will come together for nice talk and delight. 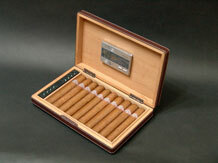 Likewise, top executives and directors from the Cuban Tobacco Industry will be there. Romeo y Julieta is celebrating because of the addition of a new size to its brand portfolio: The Short Churchills. This brand with a history of more than 130 years in existence is one of the best selling brands at the Travel Retail The Romeo No 1, 2 and 3 along with Exhibition No 4 and the Churchills are well-known due to its sale performance at the Travel Retail. The Short Churchill is a classic Robusto (ring gauge 50 and 124 mm in the length) that offers a well balanced and aromatic blend within this great cigar which kindly combines excellent flavor and quality. To run true to its name and tradition, the Romeo and Julieta Cocktail will be a wonderful opportunity for those devoted to the flavour of the brand being able to taste this new Habano.